Dental Implants allow the replacement of a single tooth or multiple teeth without relying on any adjacent teeth for strength or support. 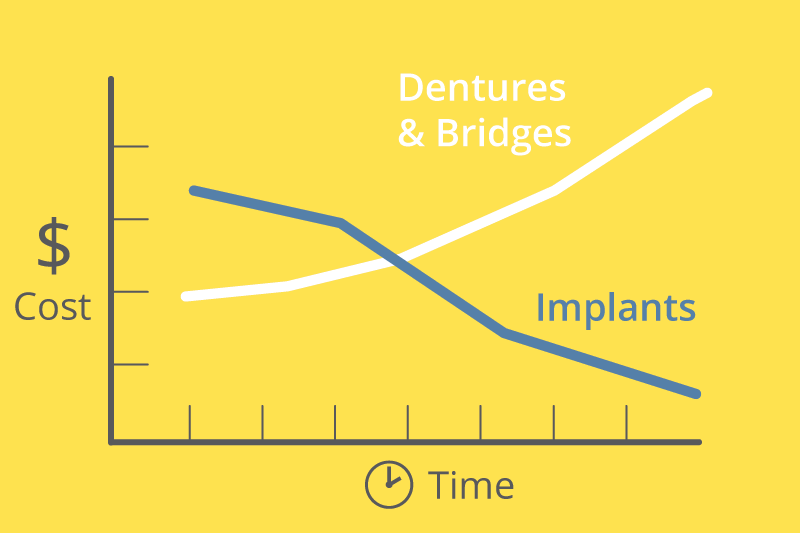 Implants are generally considered the first alternative to bridges, partials, or dentures. Of the many benefits dental implants afford, the ability to replace teeth without affecting or altering the adjacent teeth is the most obvious benefit. Dr. Reese uses dental implant “posts” that are made of the same biocompatible metal (Titanium) that hip and knee implants are fabricated. This new post and crown can be used for replacement of a single missing tooth, or multiple implants may be placed to avoid a removable partial or full denture. Beneftis of choosing Dental Implants? Offers security and confidence to chew and speak in social settings. Restore the natural smile once thought to be lost. Replacement for a missing single tooth. A series of anchors to secure a fixed bridge, or segment of teeth without the need for unsightly and bothersome metal ‘clasps’. Remove the acrylic that covers the roof of the mouth in a conventional upper denture. Dr. Reese is an accredited Fellow of the American Academy of Implant Dentistry, which required extensive training and testing of his expertise in a field that is continuing providing new and improved techniques to the benefit of patients seeking alternatives to permanent tooth replacement. Dr. Reese is also board certified by the American Board of Oral Implantology. Dr. Reese is also a Fellow and past President of the Midwest Implant Institute and now teaches implant dentistry to other dentists under his educational endeavors of “Cutting Edge Dentistry”. Dr. Reese is also a Fellow and former President, Midwest Implant Institute, where he has also lectured and taught surgical placement techniques. AAID credentialed dentists invest significant time and energy into dental implant-focused training, above and beyond their basic dental and/or specialist education. Because they have a thorough knowledge of all aspects of dental implants and treatment options, they understand the big picture — and they’re dedicated to putting your smile, your needs and your health first. AAID credentialed dental implant experts are passionate about helping you live your life the way you want to. They’re happy to talk with you about treatment options, share their success stories and answer your questions. Dental implants can sometimes be placed at the time of tooth removal or more typically after the gum has healed after a tooth has been removed. There may need to be a gentle ‘peel back’ of the overlying gum tissue to allow a socket prepared in the jaw bone where the original tooth root was. After a healing period, the implant becomes rigidly fixed into place and supports a synthetic ‘crown’ or tooth to be permanently cemented on top for chewing and smiling. Most of our implant patients are surprised at the uneventful healing period after having an implant placed. “It was easier than having the tooth taken out!” is a common description. If several implants are needed to be placed, or you are anxious and intimidated about dental treatment we can discuss one of several anesthesia/sedation options for your appointment. Patients who have previously been told they are not a good candidate for dental implants need to have a second opinion. In many cases, we are able to place implants after grafting jaw bone back in place to provide the appropriate ‘bed’ for an implant to replace the tooth or teeth. Most dental implant patients are over 50 and 60 yrs. of age, but Dr. Reese has placed implants in patients as young as 17 and as youthful as 89! As with any surgery procedure, you must be in good or reasonable health, and the infection involved with gum disease must be controlled prior to implant placement. One of the earliest studies of dental implants found over 80% still in the mouth and functioning after 12 yrs. This study done in the 70’s and 80’s has seen improvement in techniques that have resulted in success rates of over 90% depending upon the conditions and maintenance of the teeth and mouth. Various conditions affect the long term retention of implants. Your mouth, gums, and remaining teeth need to be examined and a treatment plan developed just for you to ensure a favorable outcome. Dr. Reese has the advantage of placing and restoring the implant(s) all in his office. He has over 30 years of experience in implant therapy, and understands that the function, position, and restoration are all critical factors. Your expectations need to be understood so an appropriate treatment plan and design will meet your expectations. This is not always appreciated when one doctor places the implant and another doctor restores the teeth prior to discussing the outcome. The actual implant placement typically takes less than one half hour. More time is needed if a ‘provisional’ crown must be custom made to replace the missing tooth, or more implants, grafting is needed, etc. Since dental implants are more involved than traditional bridgework, they are typically more expensive, but often more affordable over the long run. Actual costs vary with the needs and conditions. Dr. Reese will examine and determine the appropriate treatment and cost with a xray to determine actual cost for your specific needs. The social embarrassment costs. Dentures can slip or click when you chew, laugh, talk or kiss.